From 1993 through 2010, Trevor Hoffman recorded 601 career saves. That was briefly a major-league record until Mariano Rivera surpassed him in 2011. Through the 2017 season, nobody else had as many as 500 — or will get there soon. It was enough to get Hoffman into the Hall of Fame in 2018, when he received more than 79 percent of the baseball writers' votes in his third year on the ballot. There is something to be said for such a reliable closer. Hoffman converted nearly 89 percent of his saves over the course of his 18-year career, ranking third out of the 50 closers with the most saves, behind only Rivera and Joe Nathan. Trevor was the third of three children in the family, all boys. The oldest was named Greg; middle brother Glenn was an infielder in the major leagues for nine seasons (1980-87; 1989). Glenn also managed the Los Angeles Dodgers for much of 1998 and has since been a coach for that team (1999-2005) and the club for which Trevor starred, the San Diego Padres (2006-15). In 1986, Trevor Hoffman graduated from Savanna High School in Anaheim, a 20-minute drive from Bellflower. He played shortstop, since his father had banned him from pitching for fear of injury to his arm. He was not offered a scholarship after high school, and so he went first to junior college — Cypress College, a short distance west of Anaheim. Undersized as a schoolboy, Hoffman eventually grew to 6-feet-1 and 200 pounds. Hoffman went on to attend the University of Arizona, where he excelled as a shortstop. He played with future major leaguers J.T. Snow and Scott Erickson, along with future coach Kevin Long. Hoffman led the team with a .371 batting average in 1988, and showed off his strong throwing arm at short. Hoffman spent two years in the minors as a pitcher, developing his off-speed and breaking pitches. His fastball came easier to him because he had such a strong throwing arm. It was during these two years that Hoffman began to develop his changeup, his top pitch for years to come. Hoffman finally reached his dream on April 6, 1993, when he made his major league debut with Florida. He kept the game close, striking out Eric Davis with the bases loaded to end the top of the ninth, but the Marlins could not score in their half of the inning and lost, 4-2. A big early moment in his career came eight days later at Candlestick Park in San Francisco. Pitching in the eighth inning as a setup man, Hoffman faced the very dangerous Barry Bonds. Bonds, pinch-hitting because he had a pulled hamstring, represented the tying run at the plate. Hoffman fooled Bonds and retired him on a little trickler to first base. In the middle of that season, Hoffman was traded to the Padres for slugger Gary Sheffield. This was part of San Diego’s “Fire Sale” in which they traded many of their top players, such as Sheffield, for young talent. Fans disapproved of the trade, and Hoffman was booed during his first few appearances with the club. In his San Diego debut the day after he was acquired,7 he gave up three runs in one inning; he allowed eight runs over his first three innings, covering three appearances. He also blew his first save opportunity of the season soon after, and he finished the season with only five saves and a 3.90 ERA. Hoffman lost his superior fastball after hurting his shoulder while playing football and volleyball during the 1994 strike. He needed surgery on his rotator cuff after the 1995 season.9 Thus, he refined his changeup and used it to dominate hitters throughout his career. His changeup was his specialty pitch — he claims he started practicing with it as an eight-year old playing Wiffle ball in his backyard.10 It became truly effective, though, after Padres teammate Donnie Elliott showed him a different grip. After the bullpen doors opened, Hoffman was almost unstoppable. Intimidating hitters with his big windup, high kick, and long stare, he established himself as one of baseball’s toughest pitchers to face, both physically and mentally. Starting on July 25, 1998, with AC/DC’s “Hell’s Bells” blasting through the PA system, Hoffman’s entry gained an ominous extra dimension. Hoffman had the opportunity to play in only one World Series during his career, in 1998, when his Padres played the powerhouse Yankees. The Yankees had 112 wins in the regular season that year, making them the heavy favorites. Hoffman was highly efficient that year, converting 41 straight saves over the course of 1997 to 1998.11 Unfortunately for San Diego, the Yankees swept them easily. Hoffman's lone appearance in the series came in Game Three, during which he surrendered a go-ahead three-run home run to eventual World Series MVP Scott Brosius in the eighth inning. Despite the disappointing result, this World Series was one of Hoffman's most memorable experiences. Since batting artist Tony Gwynn played on the Padres with him for many seasons, Hoffman was often overshadowed and considered the second-best player on the team despite how much he contributed to the team’s success. When Gwynn retired following the 2001 season, Hoffman became the undisputed centerpiece of the franchise. He made the All-Star team again and broke Dennis Eckersley's record for most saves with one team.12 Sports Illustrated even issued a May article titled: "The Secret of San Diego: Why Trevor Hoffman of the Padres is the best closer (ever).” Although he was not the main face of the Padres for much of his career, Hoffman still collected some prestigious awards. A seven-time All-Star, Hoffman led the National League in saves in 1998 and 2006. In addition, he captured the NL Rolaids Relief Man of the Year in both of these years, as well. Following the 2003 season, Hoffman was a free agent for the first time. He had lengthy conversations with the Cleveland Indians, but even though Cleveland offered him more money,13 Hoffman eventually ended up re-signing with the Padres.14 San Diego’s general manager at the time, Kevin Towers, said of the new deal: "This is probably the most significant signing that I've had. This guy is the face of our organization. I can't put into words what he means to our community." In 2004, Hoffman passed Jeff Reardon and Eckersley on the all-time saves list, securing the #3 spot. In May of 2005, Hoffman became just the third pitcher to record 400 saves, alongside John Franco (424) and Lee Smith (478).15 Hoffman took home the NL Pitcher of the Month and Delivery Man of the Month awards for his performance. Partially due to Hoffman’s success, the Padres went 22-6 that month, the best in franchise history. Hoffman finished that year 43 for 46 in save opportunities, the second-most saves in the National League. Unfortunately for the Padres, despite a successful 2005 season that brought them to the NLDS, they ended up being swept by the St. Louis Cardinals. 2006 was another eventful year for Hoffman. To start with, his brother Glenn joined the Padres as third-base coach. Trevor made the All-Star team, but he was the losing pitcher in the game. Perhaps rattled, two of Hoffman's five blown saves that year came in the week after his subpar performance in the All-Star Game. However, he recovered and later that year would pass Smith for the most saves in major-league history. In August of that same year, he appeared in his 776th game as a reliever for San Diego, breaking Elroy Face's record for most appearances by a reliever with one club. Face accomplished the feat with the Pittsburgh Pirates. Hoffman helped the Padres clinch the NL West for the second straight season, recording his eighth career 40-save season along the way. However, the Padres again lost to St. Louis in the NLDS. Nonetheless, Hoffman was awarded The Sporting News NL Reliever of the Year for the third time in his career, and he finished as the runner-up for the Cy Young Award for the second time in his career (the other time was 1998). In 2007, Hoffman continued to add to his already impressive collection of records and awards, but one blown save at the end of the year is what is sadly remembered from that year. In an April win over the Dodgers, Hoffman earned the save in his 803rd game pitched for the Padres, breaking the major-league record for games pitched for one team. The record was previously held by Walter Johnson of the Washington Senators and Face (it has also since been surpassed by Mariano Rivera). In June, Hoffman recorded his 500th career save, helping him to make the All-Star team again.16 On September 8, Hoffman struck out the Colorado Rockies' Todd Helton for his 1,000th career strikeout, which was notable considering that Hoffman had only pitched 917 innings at the time. Unfortunately for San Diego, Hoffman struggled toward the end of the year. One strike away from getting San Diego to the playoffs for the third straight year, Hoffman gave up a game-tying, two-out triple in the ninth inning to Tony Gwynn, Jr. of the Milwaukee Brewers — the son of his longtime teammate. The Padres went on to lose in the 11th inning, 4-3. Hoffman finished the year converting 42 of 49 save opportunities. Hoffman missed the first month of the 2009 season with a strained rib cage, which led to a brief injury-rehab assignment in the minors. He recovered well in May, as he was named NL Pitcher of the Month and MLB Delivery Man of the Month, recording 11 saves in 12 scoreless appearances. He made his seventh and last All-Star appearance that same year, filling in as a late replacement for the injured Jonathan Broxton of the Los Angeles Dodgers. 2010 was Hoffman's final year in the majors. Milwaukee re-signed him to a one-year deal with a mutual option for 2011.21 After a rocky start, however, he lost his closer role to John Axford. He still got occasional chances to close, though — and on September 7, 2010, Hoffman recorded his 600th career save,22 becoming the first major-leaguer to achieve this milestone.23 He retired following that season,24 after Milwaukee turned down his second-year option.25 Hoffman felt that he could still pitch at the major league level, but with all the available closer spots filled, he was not interested in being a setup man. He retired with a 61-75 record, 601 saves, a 2.87 ERA, and 1,133 strikeouts. Following his retirement, Hoffman joined the Padres' front office as a special assistant.26 He also worked on both the pregame and postgame TV shows for Fox Sports San Diego. On August 21, 2011, his number 51 was retired by the team.27 He was the ninth inductee into the Padres Hall of Fame.28 He, his wife Tracy, and his sons Quinn, Wyatt, and Brody were all in attendance. Trevor Hoffman's career was filled with awards and recognition — and in 2018, he received the ultimate recognition when he was elected to the Hall of Fame. “Padres announce plans to retire Hoffman’s No. 51,” Sports Illustrated (online edition), June 16, 2011, http://www.si.com, accessed January 2, 2016. Center, Bill. "The Ace of Saves: Padres’ Hoffman Becomes No.1 Closer of All Time," San Diego Union-Tribune, September 26, 2006. Center, Bill. “Hoffman joins alumni in Padres front office,” SignOnSanDiego.com, January 12, 2011, http://www.sandiegouniontribune.com/news/2011/jan/12/hoffman-joins-alumni-padres-front-office/, accessed January 2, 2016. Center, Bill. “Trevor Hoffman adds coaching duties,” UTSanDiego.com, September 12, 2013, http://www.sandiegouniontribune.com/news/2013/sep/12/padres-mlb-trevor-hoffman-coaching/, accessed January 2, 2016. Haudricourt, Tom. “Selig reflects on Hoffman’s career,” Milwaukee Journal Sentinel, January 12, 2011. Lin, Dennis. “Now full-time, Hoffman tackles new job,” UTSanDiego.com, February 15, 2014, http://www.sandiegouniontribune.com/news/2014/feb/15/trevor-hoffman-padres-upper-level-pitching-spring/, accessed January 2, 2016. Olney, Buster. “Trevor Hoffman’s dive into history,” espn.go.com, September 8, 2010, http://espn.go.com/blog/buster-olney/insider/post?id=1227, accessed December 29, 2015. 1 Associated Press, “Hoffman helps kids with kidney problems,” June 20, 2005. 2 Chris Foster, “His Father Was a Save Artist Too,” Los Angeles Times, July 14, 1996. 4 “Marlins Surprise Hoffman,” Sarasota Herald-Tribune, November 18, 1992: 5C. 55] Tom Cushman, “Deep in the Heart Hoffman,” San Diego Magazine, November 11, 2006. 6 S.L. Price, “Reliever Hoffman has batters feeling the heat,” The News (Boca Raton, Florida), April 16, 1993: 3B. 7 Pepsi Max Field of Dreams Game Program, Cooperstown, New York: Pepsi Corporation, 2013, Print. 8 Associated Press, “Padres’ Hoffman to have Shoulder Surgery,” Miami Herald online edition, http://www.miami.com/mld/miamiherald/sports/baseball/5259774, February 25, 2003, accessed December 29, 2015. 9 Buster Olney, “Change Artist,” ESPN the Magazine, September 11, 2006. 10 Bill Center, “One Pitch Wound Up Changing Baseball History,” San Diego Union-Tribune, http://www.sandiegouniontribune.com/uniontrib/20060926/news_lz1x26pitch.html, September 26, 2006, accessed February 16, 2016. 11 “Alou ends Hoffman’s save streak at 41,” USA Today, July 27, 1998, Print. 12 Bill Center, "No. 321 is Vintage Hoffman," The San Diego Union-Tribune, May 2, 2002, http://www.uniontrib.com/sports/padres/20020502-9999_1s2padres.html, accessed December 29, 2015. 13 Tom Krasovic, ”Hoffman takes San Diego discount to remain a Padre,” SignOnSanDiego.com, November 5, 2003, http://legacy.utsandiego.com/sports/padres/20031105-1703-trevorsigns.html , accessed December 30, 2015. 14 Chuck Crow, “All-time saves leader was almost an Indian,” The Plain Dealer, September 12, 2010. 15 Jayson Stark, “Arizona not the apple of Vasquez’s eye,” espn.go.com, May 27, 2005, http://proxy.espn.go.com/espn/print?id=2068831&type=story, accessed December 30, 2015. 16 Associated Press, “Padres’ Hoffman secures place in history with 500th save,” espn.go.com, June 7, 2007, http://espn.go.com/mlb/recap?gameId=270606125, accessed December 30, 2015. 17 Bill Center, “No relief for Hoffman: ‘It still hurts,’” UTSanDiego.com, January 25, 2008, http://legacy.utsandiego.com/uniontrib/20080125/news_1s25hoffman.html, accessed December 30, 2015. 18 “Sources: Hoffman, Brewers have deal,” espn.go.com, January 8, 2009, http://espn.go.com/espn/print?id=3818472, accessed December 30, 2015. 19 Tim Sullivan, “Club and closer still need each other, but can they mend the fences?”, UTSanDiego.com, December 11, 2008, http://www.sandiegouniontribune.com/news/2008/dec/11/1s11sullivan215146-club-closer-still-need-each-oth/, accessed February 16, 2016. 21 Buster Olney, “Hoffman to re-sign with Brewers,” espn.go.com, October 5, 2009, http://espn.go.com/espn/print?id=4533333, Accessed December 30, 2015. 22 Tom Haudricourt, “Hoffman hits 600 save mark as Brewers win,” Milwaukee Journal Sentinel, September 8, 2010. 23 Adam McCalvy, “Call the Hall: Hoffman gets 600th save,” MLB.com, September 8, 2010, http://m.mlb.com/news/article/14424616/, accessed December 29, 2015. 24 Associated Press, “Trevor Hoffman’s option declined,” espn.go.com, November 2, 2010, http://espn.go.com/espn/print?id=5757290, accessed January 2, 2016. 25 Bill Center, “Hoffman retires, will wear ‘different hats’ for the Padres,” SignOnSanDiego.com, January 11, 2011, http://www.sandiegouniontribune.com/news/2011/jan/11/hoffman-retires-will-join-padres-front-office/, accessed January 2, 2016. 26 Matt Snyder, “Trevor Hoffman takes position with Padres’ front office,” CBSSports.com, September 12, 2013, http://www.cbssports.com/mlb/eye-on-baseball/23613251/trevor-hoffman-takes-position-with-padres-front-office, accessed January 2, 2016. 27 Tim Sullivan, “Grand gesture is prime Trevor Time for good reason,” SignOnSanDiego.com, August 21, 2011, http://www.sandiegouniontribune.com/news/2011/aug/21/grand-gesture-prime-trevor-time-good-reason/, accessed January 2, 2016. 28 Dennis Lin, “Hoffman inducted into Padres Hall of Fame,” UTSanDiego.com, August 30, 2014, http://www.sandiegouniontribune.com/news/2014/aug/30/trevor-hoffman-inducted-padres-hall-of-fame-petco/, accessed January 2, 2016. 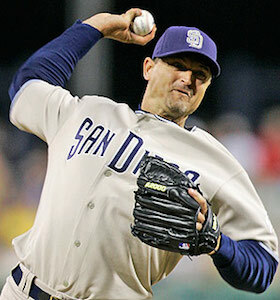 29 “Padres appoint Trevor Hoffman as Upper Level Pitching Coordinator,” MLB.com, September 12, 2013. 30 Dennis Lin, “Trevor Hoffman’s new title,” San Diego Union-Tribune, February 22, 2015. 31 A.J. Cassavell, "Hall's Bells: Cooperstown Rings for Hoffman," MLB.com, January 24, 2018, https://www.mlb.com/news/trevor-hoffman-elected-to-hall-of-fame/c-265259268.